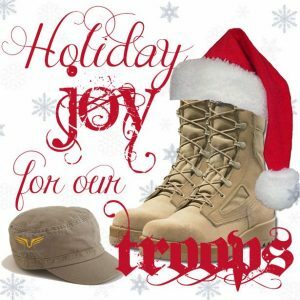 The holiday season can be tough for our armed forces, especially if they have to spend it away from their family and friends. That’s why we are personally asking all of our volunteers to help LSF spread holiday cheer to our service members by participating in our 2014 “Holiday Joy for our Troops” campaign! Send us either a video or take a picture wishing our military men and women a happy holiday! So grab your smartphone and get festive and creative! This is one activity the entire family can get involved in! Send your 10-30 sec video and/or pictures to events@lonesurvivorfoundation.org by December 20th. The LSF Team will compile all submissions and post on our website on December 21. Make sure you tag us @LS_Foundation and use hashtag#LSFJoy on any of your social media pages. Let’s make sure we make this one holiday our troops won’t forget! previous post: LSF can now accept non-cash donations!